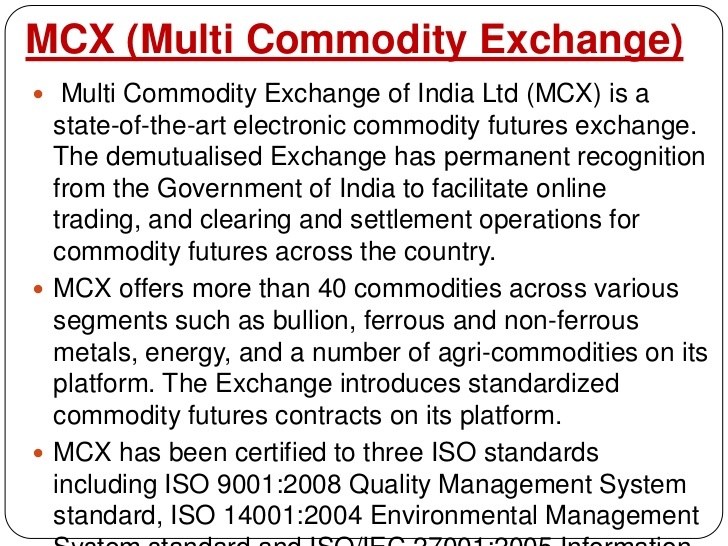 Mumbai, 2016: Multi Commodity Exchange of India Ltd (MCX), India’s No.1 commodity exchange announced its unaudited financial results for the first quarter ended June 30, 2016. The Company adopted the Indian Accounting Standards (IND AS) from April 1, 2016. Accordingly, these financial results have been prepared in accordance with the Companies ( Indian Accounting Standards) Rules 2015 ( IND AS) prescribed under section 133 of the Companies Act, 2013. · For the quarter ended June 30, 2016, MCX’s total income increased by 23% to Rs. 93.79 crore from Rs.76.17 crore for the corresponding quarter ended June 30, 2015. · EBITDA for the quarter ended June 30, 2016 increased by 37% to Rs. 52.99 crore from Rs.38.82 crore for the corresponding quarter ended June 30, 2015. · Net Profit (before Other Comprehensive Income) for the quarter ended June 30, 2016, increased by 55% to Rs. 32.81 crore from Rs. 21.22 crore for the corresponding quarter ended June 30, 2015. · For the quarter ended June 30, 2016, the EBITDA margin was 57 % and PAT (before Other Comprehensive Income) margin was 35%. · The average daily turnover traded on the Exchange has increased by 16% to Rs. 24,591 crore in Q1 FY 2017 from Rs. 21,217 crore in the corresponding quarter of Q1 FY2016. · The total number of commodity futures contracts traded on the Exchange for the quarter ended Q1 FY2017 increased by 29% to 62 million from 48 million in the corresponding quarter of Q1 FY2016. “Looking ahead, our priority is to continue leveraging our strengths as well as our leadership position in the industry for the benefit of our stakeholders. We remain confident that MCX will continue to play a pivotal role in India’s quest for a vibrant commodity market in India”, he added. Having commenced operations on November 10, 2003, Multi Commodity Exchange of India Limited (MCX) is India’s first listed, national-level, electronic, commodity futures exchange with permanent recognition from the Government of India. In the financial year 2015–16, the market share of MCX was 84.30%. MCX offers the benefits of fair price discovery and price risk management to the Indian commodity market ecosystem. 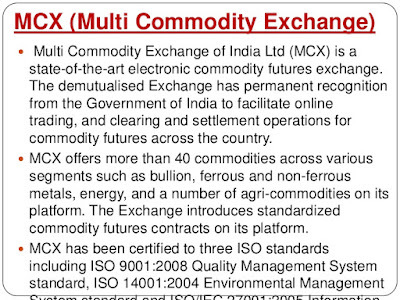 Various commodities across segments are traded on MCX. These include bullion, energy, metals and agri commodities. The exchange has forged strategic alliances with various Indian and International commodity exchanges and business associations.